Mr. Colebrook was a painter very early in his life. He was born in 1950 and by age six he had presented a self portrait to his mother. This charming little picture, along with many more childhood paintings survive, thanks to her, and they attest to what has always been a driving force in his life. As a child, he told grown-ups that he wanted to be a painter and a sculptor when he grew up. Then, amazingly, through all of the opportunities and distractions of the 1960’s and '70’s, Theodore actually became what he wanted to be. Now, the growing number of those who admire and collect his work are thrilled that he did. Knowledge of the subject is clearly evident throughout Teddy’s work. Close examination of his paintings reveals subtle, wonderful detail. From stirrup leathers to stone walls and rigging to the rising tide, the serious viewer understands that the objects of his gaze are part of his life experience. Viewers can feel what he paints in the changing terrain of the landscape and can smell the smoke in the humid air. Clients of commissioned works have described how they actually see more in their own interiors or their own gardens after having studied Theodore’s fluent depictions. But then, of course, that is what good painters have always done. Theodore has a wonderful life in addition to his painting career. He and Cynthia, his wife since 1972, currently live in Carbondale, Colorado and spend time aboard their 45 foot sailboat, Topaz, on the East Coast of the United States. Cynthia is a writer, poet and senior consultant to non-profit corporations. They have two daughters and five grandchildren. 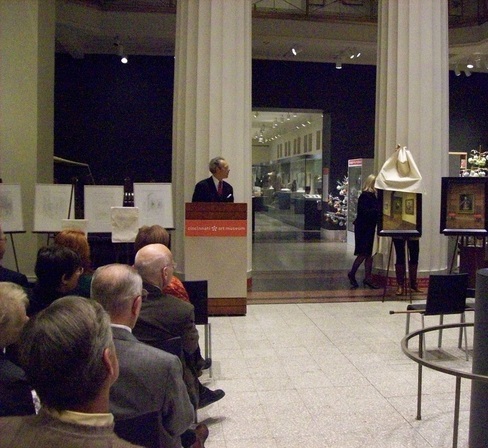 The unveiling at the Cincinnati Art Museum, 2010.